Sweat shirt orders -LAST CHANCE ! !!!!! WE NEED FLAG BIKES AND LOTS OF PARTICIPATION !!!!!! Meet at the Meijer store on 111th and Burleigh St. at 6:45 am with Kick Stands Up at 7:15 am. We need to ride as a group to the staging area. The Parade steps off at 9 am. Must ride to staging area with the group. Meet at the House of Harley-Davidson at 10:45 am. Kick Stands Up at 11:15 for a short ride to the Staging Area. Parade steps off at 12:15. Must ride to staging area with the group. As always, you MUST RIDE TO THE STAGING AREA IN THE GROUP, no exceptions (this is an insurance requirement). This applies to BOTH parades. Again, NO EXCEPTIONS!! The Special Olympics t-ball tournament will be held on Saturday, July 29, at Wagner Park in Pewaukee. This has been a lot of fun in the past and everyone is encouraged to come out and enjoy the experience! We will be leaving the House of Harley at 8:30. Join the ride and the fun!! We will be cheering on the athletes while they compete in the t-ball tournament and give them their ribbons/awards at the end of the games. We should finish up approximately 1:30. There will be a concession stand with food available for purchase. Thanks, any questions, they can call Karen at 414-839-9483. 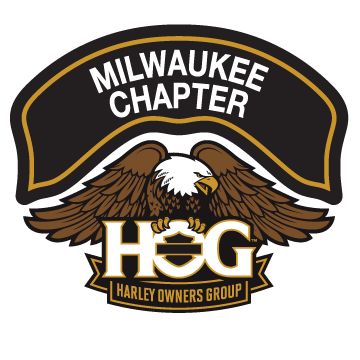 The House of Harley-Davidson would like to get the Milwaukee and Racine HOG Chapters together for a fun outing at the Brewers game on June 30th at 7:10pm. Food from Double B’s will be provided by the House of Harley (at the House of Harley) for all attending the game starting at 5:30. If you would like to ride, we will ride there as a group. ***Note*** You are responsible for the cost of your own parking. More details to come to those that RSVP. There may be a group ride to the game, weather permitting from the House of Harley. If you plan on attending please watch your e-mail for news of a ride to the game. The House of Harley-Davidson would like to get the Milwaukee and Racine HOG Chapters together for a fun outing at the Brewers game on June 30th at 7:10pm. The House will cover the cost of the tickets for you and a guest as long as you can RSVP to Kristin at kristinw@houseofharley.com by June 16. With deep regrets, it necessary to postpone the first Shrek Trek. I have found that booking hotels surrounding national holidays is a tough gig. I don’t believe anyone should have to pay $180 for a $100 hotel room just because of a national holiday. I do understand supply and demand, but I don’t like paying for it, nor do I believe Milwaukee HOG Chapter members should either. The good news is, I am not giving up. We are still going to the Headwaters of the Mississippi River….. in 2018. I will have details before year end so we can start the planning process. I sincerely regret any inconvenience this has caused. Please support the Great Lakes HOG Rally in August and/or the Milwaukee Rally, Labor Day weekend. For anyone who is going to the Suburban Milwaukee HOG Chapter Have a Heart Ride at Suburban Harley Davidson on June 10th and wants to ride in as a Chapter, please meet at the Speedway at 9091 N 76th St (Northridge outlot, north of Brown Deer Rd.) at 10 am. KSU by 10:30. Memorial Day Parade Details – FLAG BIKES NEEDED!! ….WE NEED FLAG BIKES AND LOTS OF PARTICIPATION !!!!! Reminder to sign up by May 28th. Sign up online on our website www.milwaukeechapter. com or in the book at the House. Any questions email activities@ milwaukeechapter.com or call Kitty at 414 803 7807. Peacefully passed away on May 18th 2017 at age 71, surrounded by his family. Beloved husband of Geraldine “Jerry” for 50 years. Cherish father of Daniel , Sherry, and Jennifer. Proud grandpa of Anthony, Zachary, Kelly, Alex and Ashley. Dear brother of Alfred, Terry Sullivan, James and Christine. Also loved by nieces nephews, other family and friends. Ted was born to Thaddeus and Irene in Buffalo, New York. He attended Erie County Technical School with Waukesha County Technical College. He was a maintenance mechanic for 20 plus years in the printing industry. Todd was the person people called on to help people solve their problems. 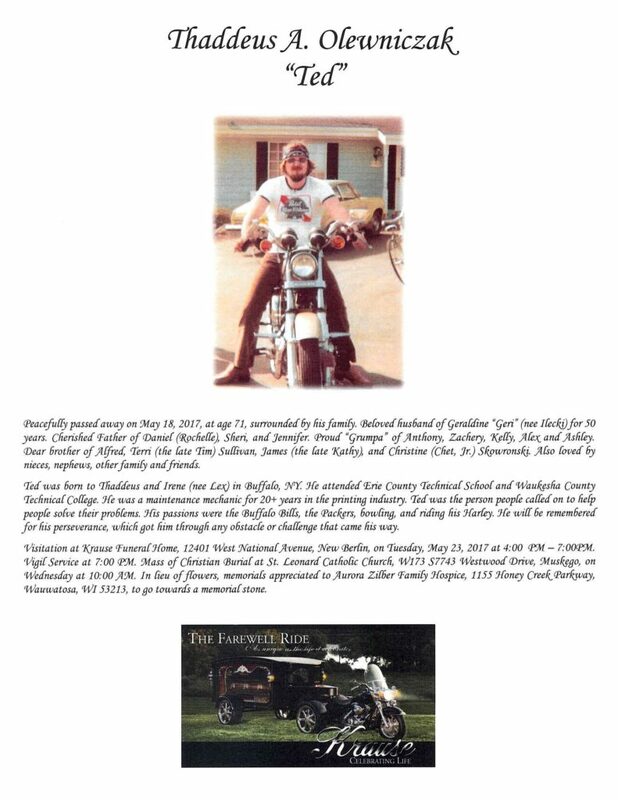 His passions were the Buffalo Bills, the Packers, bowling, and riding his Harley. He will be remembered for his perseverance, which got him through any obstacle or challenge the came his way. Visitation at Krausey funeral home, 12401 West National Avenue, New Berlin, on Tuesday May 23rd, 2017 at 4 p.m. – 7 p.m.
Vigil service at 7 p.m. Mass of Christian Burial at st. Leonard Catholic Church, West 173 South 7743 Westwood Drive, Muskego, on Wednesday at 10 a.m. In lieu of flowers, memorials appreciated to Erin Zilber Family Hospice, 1155 Honey Creek Parkway, Wauwatosa, Wisconsin 53213, to go towards a memorial stone. Action Needed: Are you Planning to Attend January “Meeting”? Social gathering and game night at Root River Center, (7220 W Rawson Ave, Franklin, WI 53132). You are invited to bring your favorite board game, card game, or poker chips along. We have the room at Root River Center from 6-9:30 pm on Tuesday, January 17. We will be doing 50/50, you will be able to renew your membership, and also purchase Holiday Party tickets. You can purchase drinks and food in the bar, Swagger. In order to be gracious guests and continue building our relationship with Root River we would like to give them an idea of how many might show up… — pleaseindicate below if you might be there and how many. Thanks! Enter your 2016 END Mileage!! The Milwaukee Chapter is accepting renewals for 2017. Please complete the renewal form AND the image release from. You can complete the forms and then print them on your computer or print and handwrite them. You can also get them at our Chapter meetings from the Membership Officers.